In the past, I usually thought of PowerPoint as a visual aid to presentations for a group of people to inform or bring them up to date presented in person or digitally. I have also seen it used as an automatic presentation on a flat screen in the lobby to inform people of upcoming events or educate about the business or institution. Those are great uses and have done much to get information out to people in a format that will help them remember. Using the animation and movement variations can also be a lot of fun. I have recently found, while doing some volunteer work at our local Work Force Center, that I have completely missed a very useful classroom tool for using with students for work with graphics. PowerPoint is a tool which can allow students to use graphics along with text for several kinds of projects effectively and simply especially for younger students. It can be a work surface that doesn’t need a lot of formatting to set up and tools that were relatively simple and easy to use. On newer PP versions, the slide size changes easily back to 4:3 to get a size that fits easily even on older monitors. That size also prints out with a quarter inch margin around it on regular 8 ½ x 11 paper so students don’t have to worry about margins when completing their work. They can work right up to the edges of the slides. Students can easily copy and paste in clip art or pictures and then resize by dragging corners or sides. They can also double click on the art or picture to bring up the format editing toolbar at the top. This toolbar allows cropping, changing colors, setting transparency, sending back or forward, adding frames and more. Experimenting is easy as the changes can all be easily undone with the CTRL +Z keys or the undo button at the top. Inserting textboxes, Word Art, shapes, screen shots of open windows and more is available through the Insert toolbar as well. Other options that make this format easy to work in are the gridlines and guides which break the slide into squares and mark the centers of the slides so students can more easily line up the parts of their creations. Made individually by students. Can then put in one presentation to share with others. For marking desks, group projects or display tables, etc. On regular 8 ½ x 11 paper there will be a ¼ margin around the entire slide. Students can publish their own stories or books using PP. They can set up the slides as the pages they want to have and import in or create their artwork in the program. 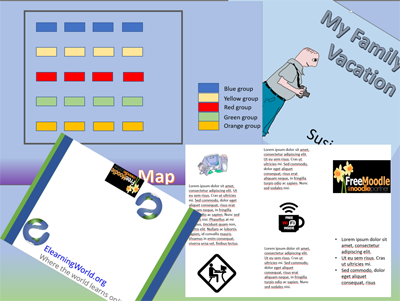 Can be shared digitally using the PowerPoint viewer or printed out. Slides can be put in portrait mode if needed and printed out very large if there is large format printer available. These can then be posted for informational purposes. With the guides and gridlines turned on it is relatively easy to figure out where the folds will go when placing textboxes and images. Easy to move things around from one panel to the next and resize clipart/pictures. I have not worked as much with Google Slides, Libre Office Impress Presentation or Open Office Presentation. I have seen some of the same features but haven’t had the time to play with them enough to look for all the features. If these are the programs available, it would be worth the time to see what features are available to your students. I had used PowerPoint for years until moving to LibreOffice when I no longer had a valid licence for it (no longer a Teacher or Student) and it’s good. Does most of what PowerPoint does but no ribbon because I believe Microsoft has a patent on that. I did try a 30 day demo version a few years back and thought it was easier to use, but don’t do enough presentations to justify the cost. And being a developer I thought at one interview that I should show off my skills, so instead created a Bootstrap 2.3.2 carousel that operated like a slide show. For teachers, single / few slide PowerPoints can be a good way of showing the objectives, tasks and outcomes and as a lesson flow tool. I used them almost every lesson and referred my lesson plan to the slides. That way both I and the students were always on the same ‘page’ rather than the lesson plan differing from what is projected. Students could also log in to Moodle and download the slides with the ‘notes’ option to the right where they could add their own notes. I use LibreOffice exclusively now, and have done for many years. The same principles apply to LibreOffice Presenter as to PowerPoint. Technology is often neutral, but it is very easy to make a boring PowerPoint presentation for sure !